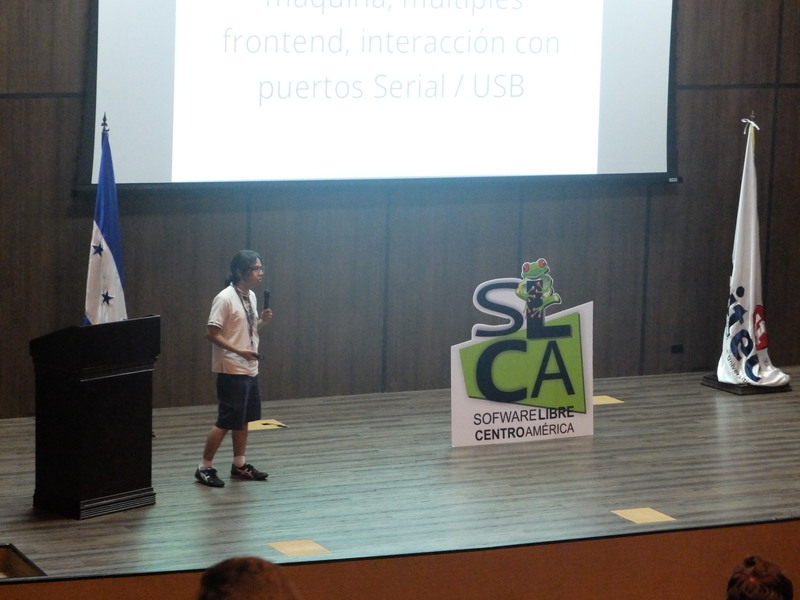 On August, 9th, in San Pedro Sula, Honduras, I presented at the seventh Central American Free Software Congress a talk on Knitting Machines, Knitapps, Free Software and Free Manufacture. I had the opportunity to present on the main auditorium of Unitec, a private, technical university. The audience of the congress was compromised mostly of professionals and students from Central America. Local and National media also covered the event. Attendants found quite intriguing the notion of small scale manufacture of knitted pieces, specially after the “Print your Own Beanie” video by Gerard Rubio, some wondered about the possible usages. Alexandre Oliva, from FSF-Latin America, asked about the parallels between Knitting jobs and Printing jobs and if we used related code. I answered that albeit there are a lot of conceptual similarities, knitting and printing are substantially different, and that we had not the chance to share code between due to their significant intrinsic differences. There were also some interesting questions regarding the usage of knitting patterns and their legal status, and about the experience of participating in GSoC. I am quite glad to have had the chance to share the interesting work being done on FOSS manufacture and the enthusiasm shown by the community to such a cool project.